While it is easy to see all the negative things happening near us and around the world, it can be refreshing to read about good things that countries are doing as well. Japan is one of those places doing just that. While many places don’t pay much heed to turtles, Japan is keeping a close eye on them. The Suma Aqualife Park is near the ocean and attracts numerous visitors who come by train. From May through September both visitors to the Park and turtles from the ocean are on the move, both using the railway but in different capacities. From 2002 to 2014 there were 13 train disruptions caused by turtles in the Kyoto and Nara areas according to the daily Japanese newspaper Asahi Shimbun. 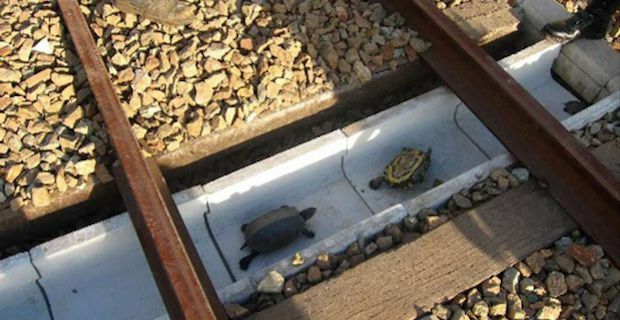 The turtles were getting caught or crushed between the railway switches when they attempt to cross the tracks causing train delays. In order to solve this problem, engineers from West Japan Railway Company and the Suma Aqualife Park in Kobe worked together. They came up with U shaped concrete ditches that go under the railway tracks near the iron switches where turtles have the tendency to get stuck and/or crushed from the train. Thankfully these tunnels seem to be helpful. Every month the 5 tunnels that have been created thus far are monitored to save any trapped turtles. Since April of 2015, 10 turtles have been saved and sent to the Suma Aquarium where they are looked after. Hopefully these escape tunnels will help save many more turtles in the future in Japan.